Today, microproduction technology makes high-precision, mostly multi-axis positioning systems absolutely necessary for both assembly and quality assurance, and they also have to be as compact as possible to enable them to be properly integrated into the production units. In most cases, only small loads need to be positioned with high accuracy. Experience shows that parallel-kinematic systems are predestined for such cases. 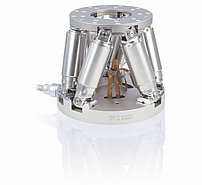 Good examples of this are the so-called hexapods, which are six-axis parallel-kinematic systems capable of exact positioning in the micrometer range. Thanks to their high stiffness, there is practically no settling time when the position has been reached. They position the loads, which means the optics, sensors, camera systems or fibers, on six axes in space, three linear and three rotary. Therefore, all drives act on a single moving platform, which results in further advantages compared to serial or stacked systems: Improved path accuracy, higher repeatability and flatness of travel, lower moved mass and therefore higher dynamics, which is the same for all motion axes, no cable management and a much more compact design. The pivot point of the hexapod can also be freely defined. Due to their parallel-kinematic design, hexapods require special control. However, the user doesn't need to worry about that because the hexapods are supplied as a complete solution with a high-performance digital controller. The user enters the drive commands as Cartesian coordinates and the controller performs all calculations necessary for the parallel-kinematic six-axis system by transforming the Cartesian target positions into control of each individual drive. With the exception of the hexapod axes, the digital controller is also able to control two further axes, for example, linear stages for rough positioning over long travel ranges or a rotation stage for 360° motion. Easy connection of a higher-level PLC is also possible. The control system can then communicate with the hexapod system, for example, via EtherCat. 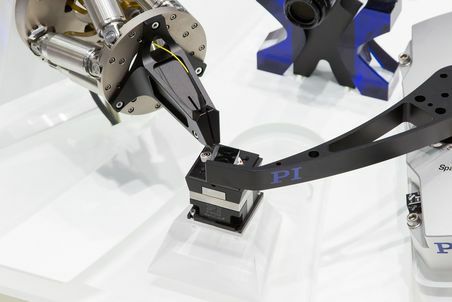 The hexapod controller then acts as an intelligent drive with respect to the PLC. The miniature H-811 Hexapod is a typical example in this class. With travel ranges to 34 mm and 42° on the linear or rotary axes and an actuator resolution of 0.04 μm as well as a load capacity of up to 5 kg, it is suitable for a number of applications in microassembly and quality assurance. The parallel-kinematics principle used by hexapods can also be used for other purposes: The SpaceFab principle is based on three XY stages that position a platform together using three struts with a constant length and a suitable joint configuration. This also makes it possible to realize fast and high-precision travel ranges and products from the SpaceFAB series are so small that they can be easily placed on the palm of the hand. They also offer travel ranges of up to 13 mm × 13 mm × 10 mm and angular motion on the rotational axes of more than 10 degrees. The position resolution is 2 nm.